will be released in hardcover on March 5. Delaine Dish asked her to be a bridesmaid for her wedding. go wrong, including the death of the groom. Will Theodosia investigate his death as a favor to Delaine? I enjoyed reading Sweet Tea Revenge. 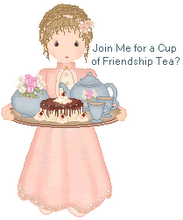 Also included in the book are recipes and tea time tips. 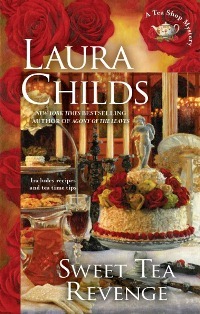 I like Laura Childs for a quick and light read, if I'm in the mood for a tea time mystery.This sounds like a fun one because Delaine is getting married,poor Delaine too bad(My real life sister is named Delaine). Oh, yay! I just finished the latest in Laura Child's scrapbooking series, I think it's called "Postcards from the Dead." The tea books are my favorites, though, & I'm looking forward to this one. Looking forward to a lovely weekend's read! I do want to get this book, love Delaine's adventures. Oh I meant Theodosia, but always enjoyed the character Delaine too. I am about halfway through this book myself and can't wait to see how it turns out. I'm also intrigued about the non-fiction tea book of hers it talks about at the back of the book. Can't wait!